The Common Loon has 4 major distinct types of vocalizations. Some of these 4 have minor sub-variations. There are, for example, type I, type II, type III, and type IV wails. The uses of the 4 major calls are elaborated on below and a sampling of each of the 4 basic major calls is offered. (You may need to increase your volumn control setting if you intend to play the vocalization samples). The "Wail" is most frequently given in the evening or at night, and can be heard for many miles. This haunting call is not an alarm call but is used to keep in contact with other loons on the same lake and surrounding lakes. The wail is a long, one, two, or three note call in situations where loons want to move closer to one another. Parents will wail to their chicks to encourage the chicks to leave the nest, to approach the parents when they have food, or to emerge from a hiding place. Listen to the "Wail"
The "Tremolo" has been described as "insane laughter"; it is 8 to 10 notes voiced rapidly which vary in frequency and intensity. 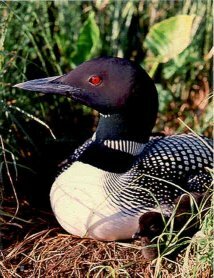 This alarm call usually indicates agitation or fear, often caused by disturbance from people, a predator or even another loon. Members of a pair will also duet using tremolo calls. This is also the only call that loons make in flight. Listen to the "Tremolo"
The "Yodel" is only made by male loons. It is used to advertise and defend their territory, especially during incubation and chick-rearing. It's also used in territorial situations and aggressive encounters with other birds. Males will also yodel if a predator is seen that may be approaching the chicks, such as when an eagle flies overhead. Yodeling males crouch flat to the water with their head and neck extended and the lower bill just over the water. Listen to the "Yodel"
The "Hoot" call is not as intense or as loud as the other calls.A soft short contact call between birds. Adults will hoot to their mates, and parents will hoot to chicks, enabling them to keep in touch with the whereabouts of the other birds. Adults also hoot to other adults of social groups residing on or visiting the same lake. Listen to the "Hoot"